Can you believe I've been silent for almost three months? It's nice to be back and into the swing of things. 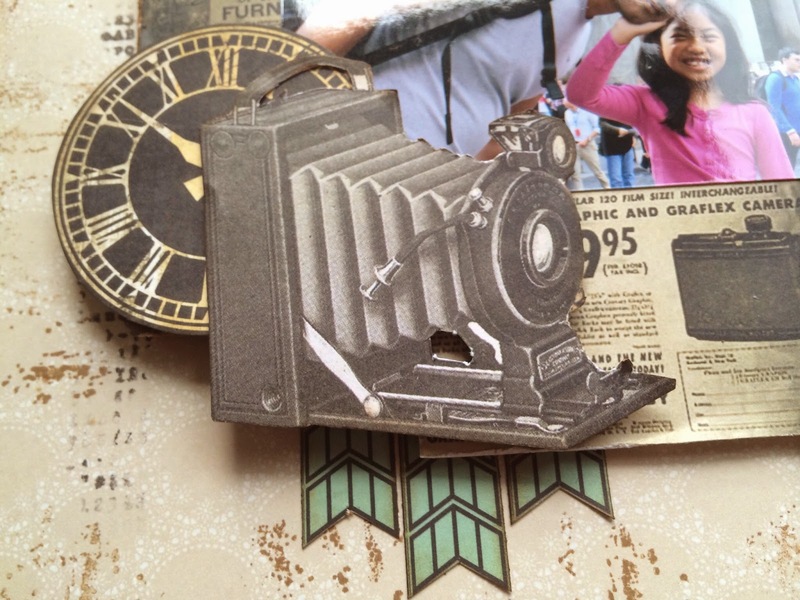 We were away in the UK for the whole of July, and although I said I would bring some scrapbooking stuff with me to work on, it stayed next to the night stand for the whole holiday. So bad. Miss C has been back in school for a month now and really enjoying Year 4. I'm happy as she loves her teachers and friends and the learning isn't so bad either. This year she'll get to go to camp and she already excited even if it isn't until November. As for me, I've been concentrating on exercising and eating better. The hubby went on a month long detox in Phuket and I joined him for a week. For those who don't know, hubby is diabetic (type 2) and wanted to learn how to reverse the disease. It can be done, but it takes retraining your body to eat the right foods; something that is harder than you think. We learnt all about raw foods and how beneficial it can be for the body. During the detox we fasted, drank clay shakes (yuck), took countless supplements and had daily (twice daily) colemas - I leave you to look that up if you've not heard of them. One week later, I lost 2 pounds. One month for hubby and he lost 13 pounds. It was quite an experience and I think everyone should try it once in their lives. I think we'll try to schedule them regularly. All in all, we both look at food differently now and I've thrown myself headlong into raw foods and vegan foods. The fridge is stuffed with fruit and veg and even Miss C enjoys some of what I make. There are lapses here and there but overall, I'd say I'm sticking to it quite well. Do I see a difference? I haven't lost much weight, even with the exercise, but I do feel more energetic and the brain fog has lessened. The only thing is planning raw food meals can be time consuming, where some recipes need one or two days of preparation (dehydration, fermentation) before you can put it on the plate. 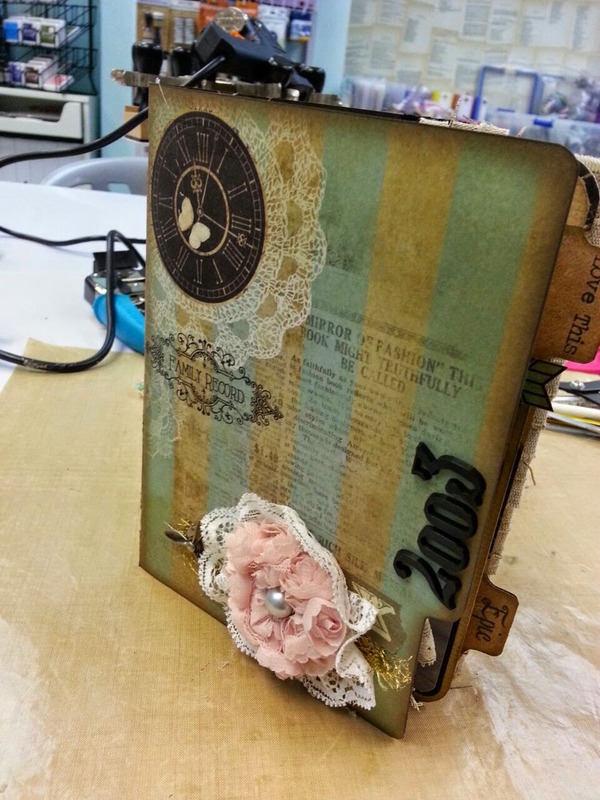 Between all of this, I've of course had to keep up with the scrapbooking. I can't say I've done huge amount and as usual, after a long holiday, it takes time to get back into it. In fact, I've had to give myself a big shove to start again - in the form of the first kit for the new HKMC kit club 2014/2015 and they are bigger and better than before. I missed out on doing a sketch layout for this month, but I will be doing them for October onwards. I'm loving the vintage feel of all the clocks and newspapers. 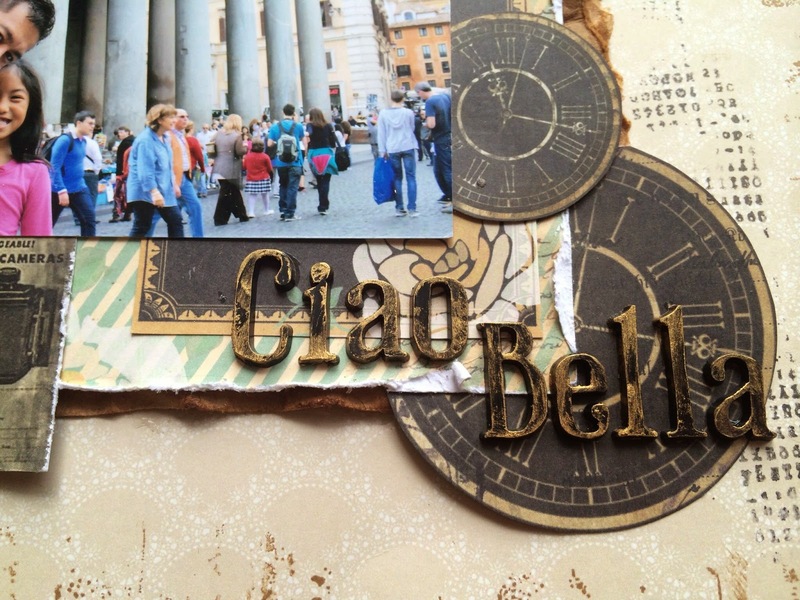 The photo was taken last year in Rome at the Pantheon. 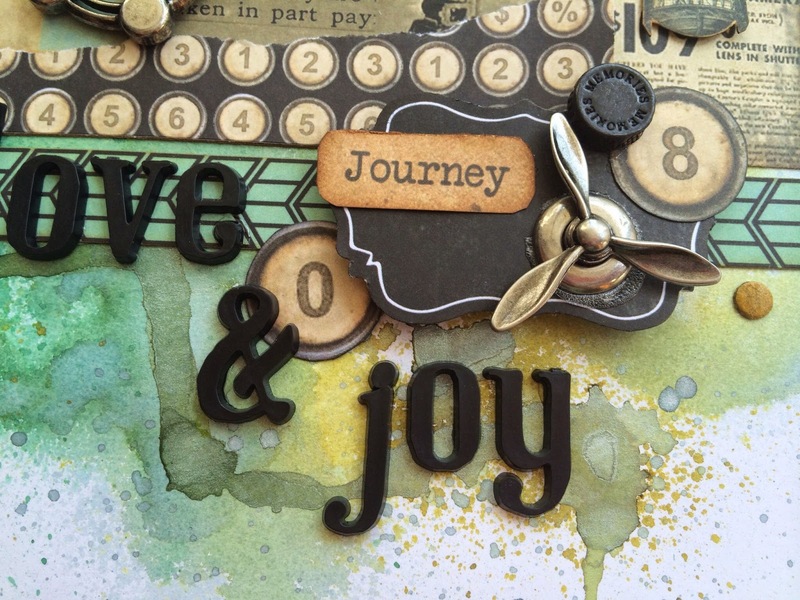 I used the optional stamp to create a border around the page and to pull in the vintage look. 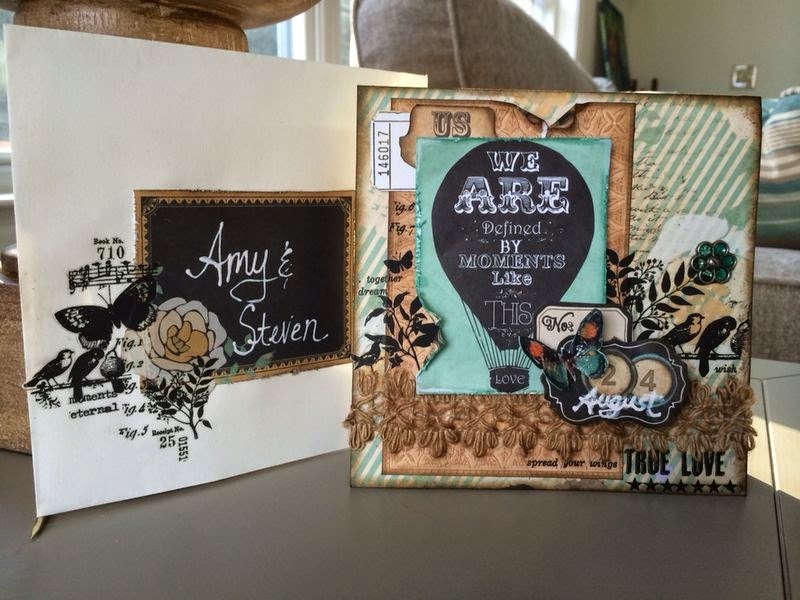 I love the Tim Holtz black alphas. 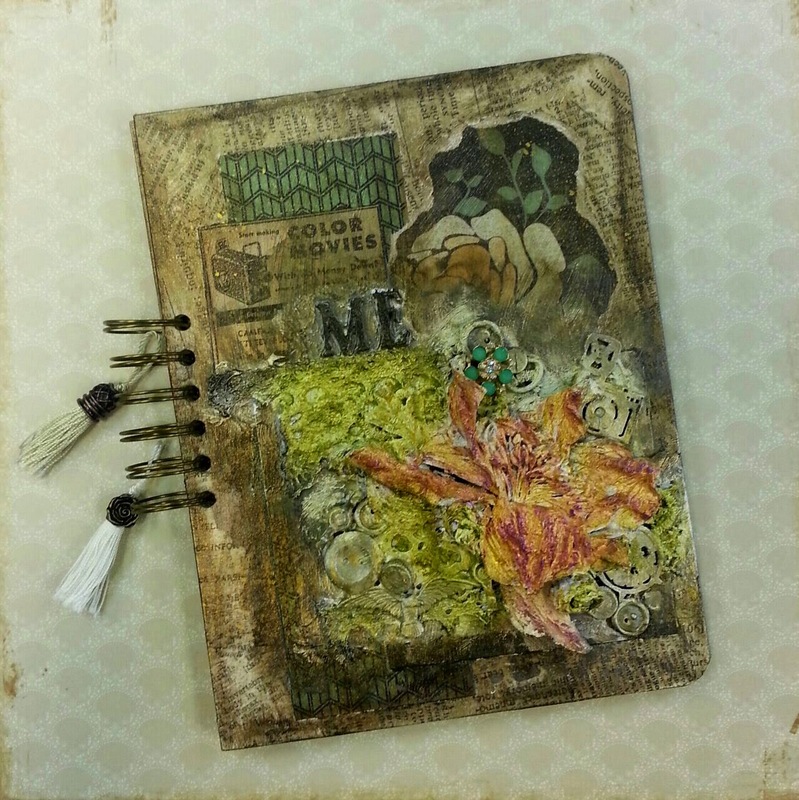 You can colour them up with distress paints or gild them with acrylic gold paint, which I did here. 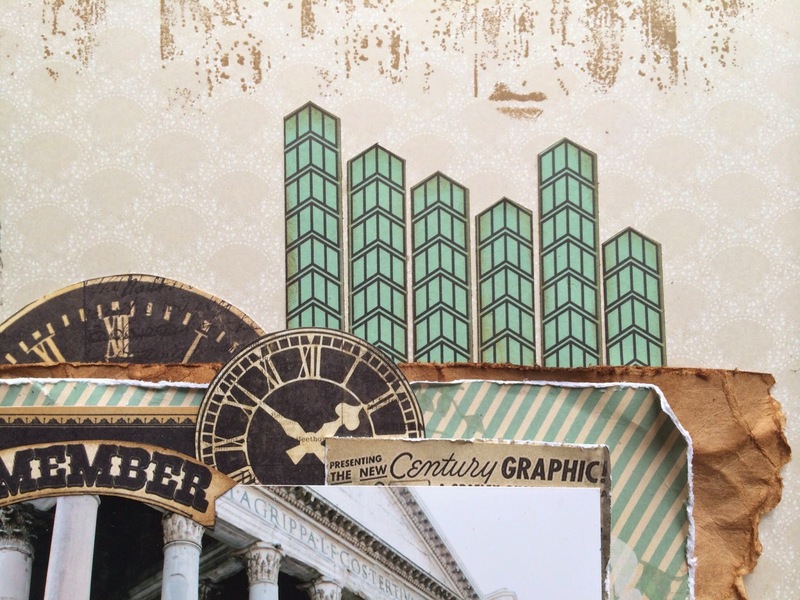 I love how the green chevron columns mimic the Pantheon's columns in the photo. 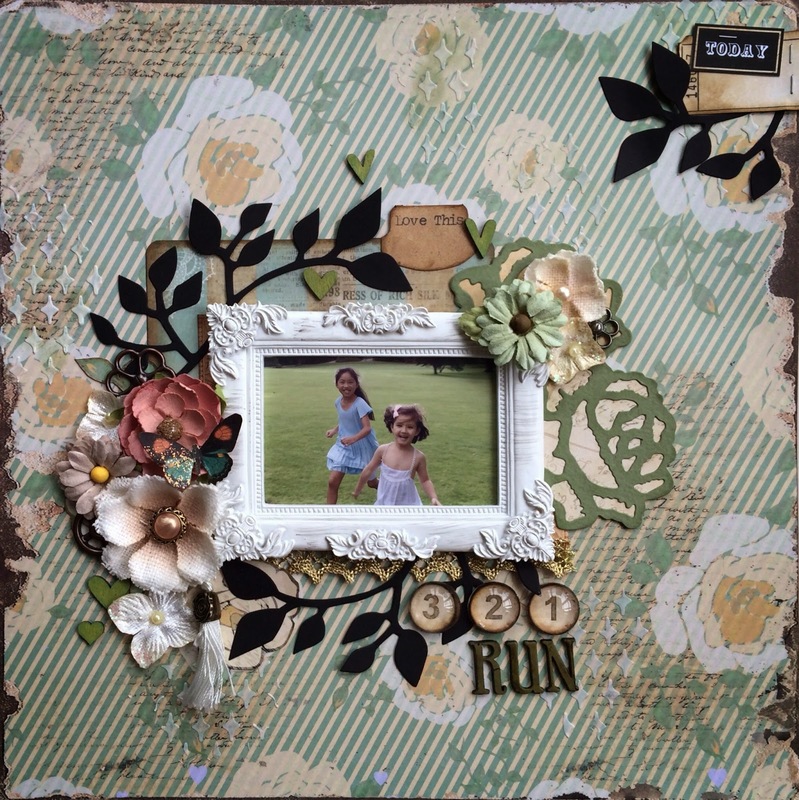 This page is markedly different from the first layout - full of roses and flowers, I matched it with a photo of Miss C running with her adorable little cousin. We were at a wedding in Sweden this summer and they had the largest lawn for them to play chase on while we waited for the bride and groom to arrive. 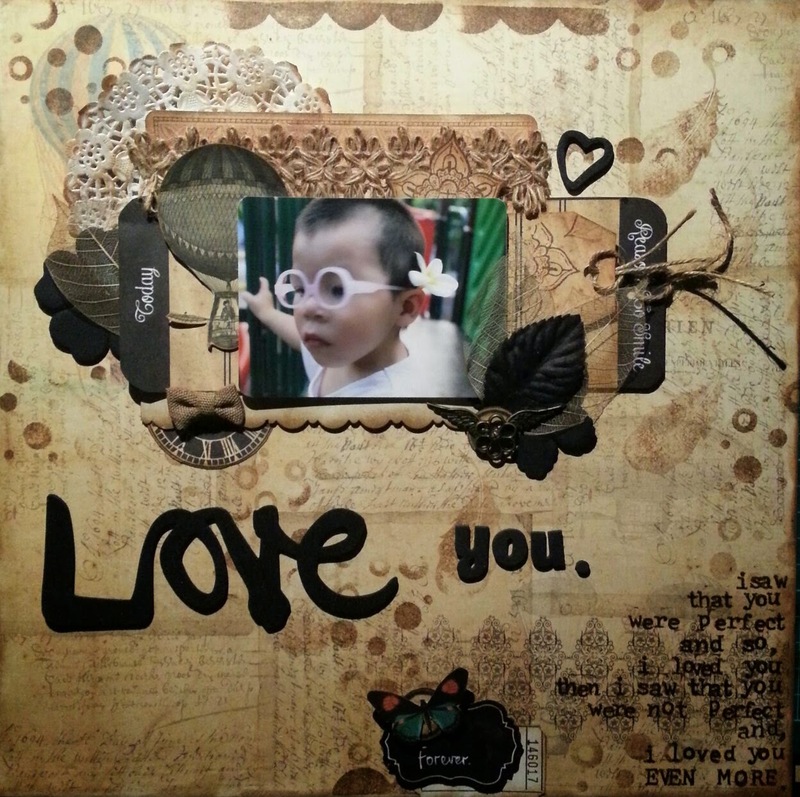 Since the background paper and embellishments were quite pale, I decided to die cut some black leaves to make a bold statement and draw your eye to the beautiful resin frame. 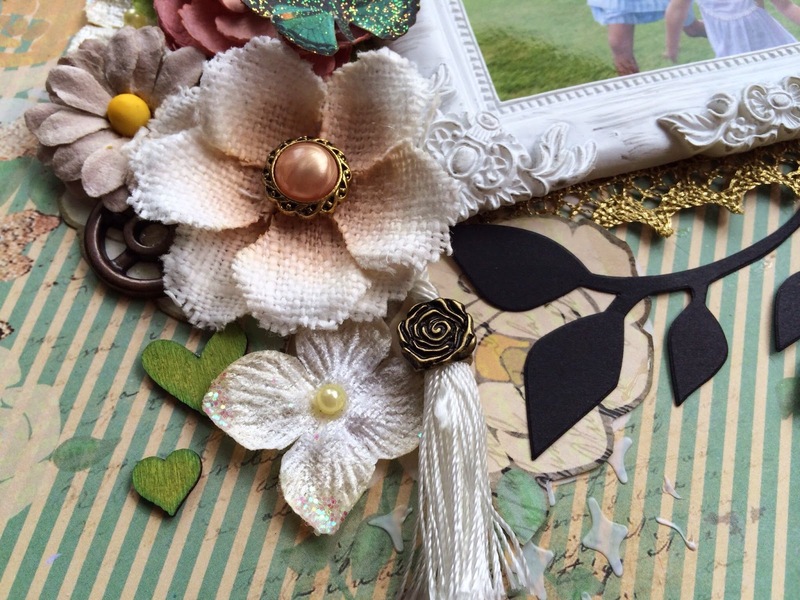 Just a smattering of flowers from my stash and the cute tassel to finish off my anchor corner. 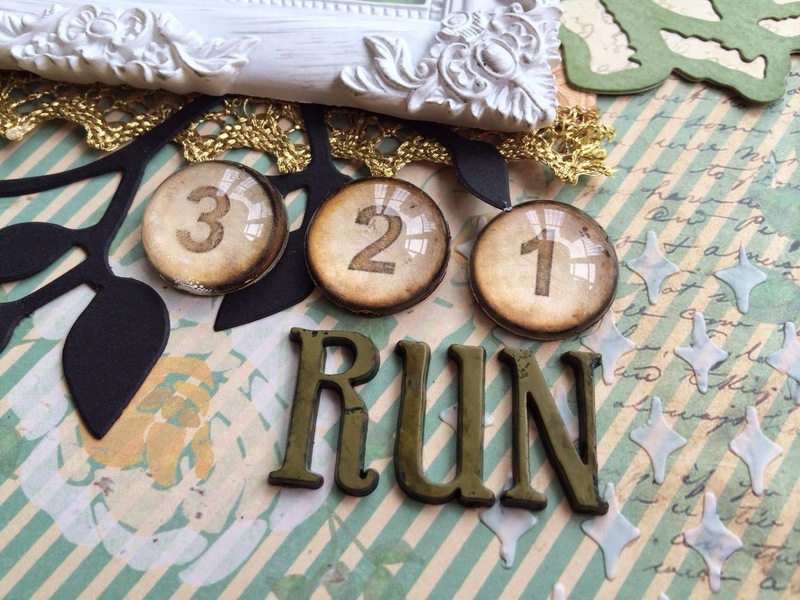 I used glass pebbles to frame the 321 numbers and covered the alphas in distress paint so the letters would not compete with the black leaves since they are originally a black as well. 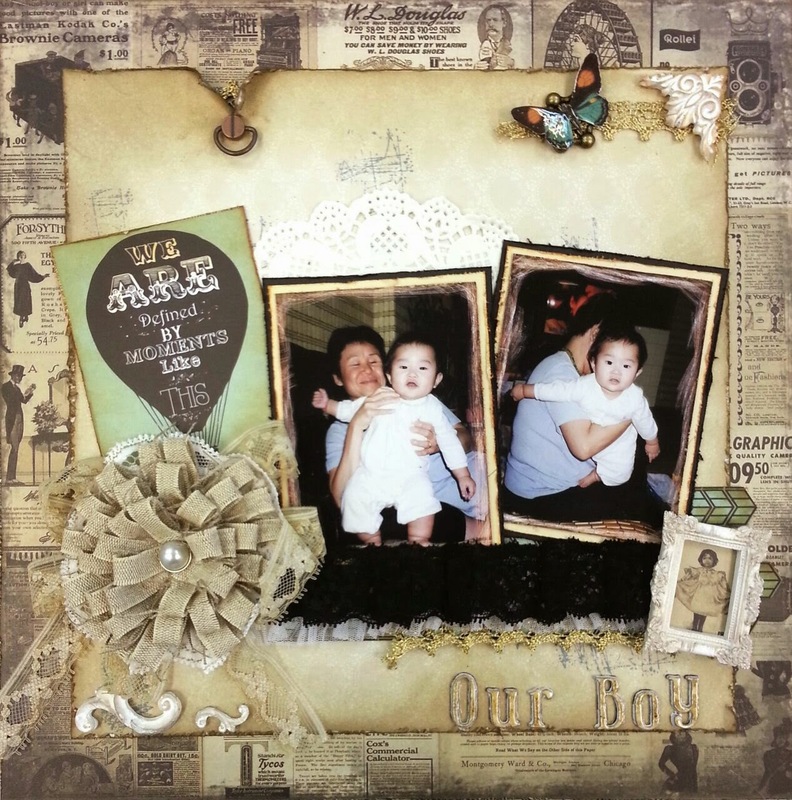 On the background paper, I added random spots of stenciled diamonds with modelling paste. 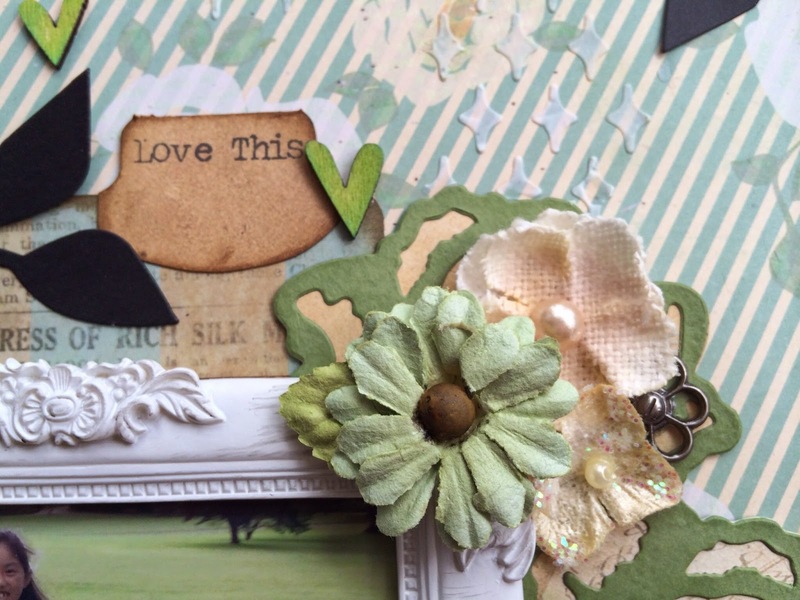 With the roses on the background paper, I knew I had to dig out my rose die to add some gorgeous roses to the top right corner of the photo frame. 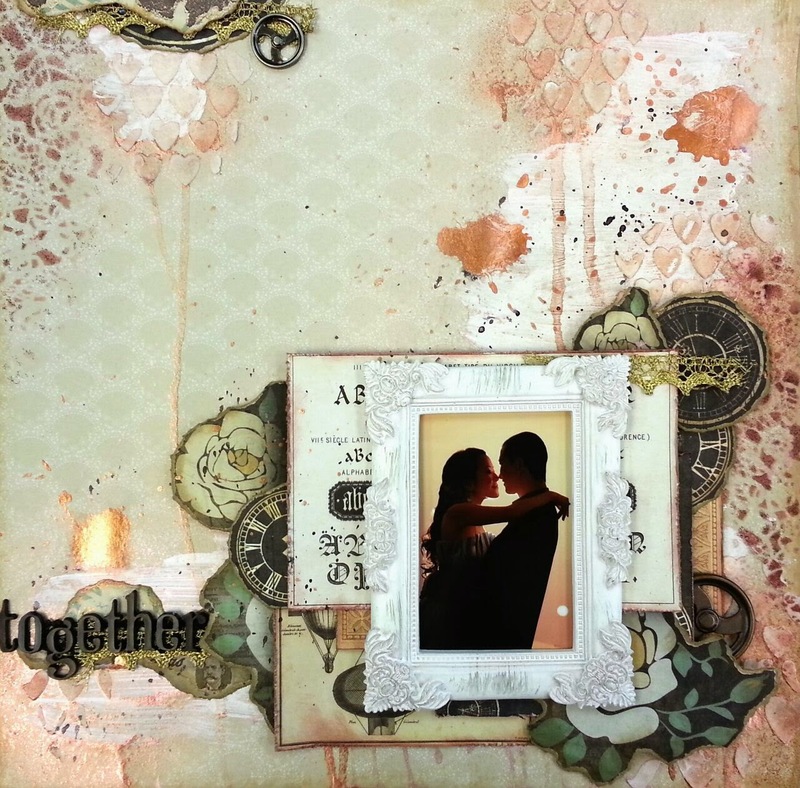 A few wooden hearts and small flowers in similar colour schemes finish off the page. 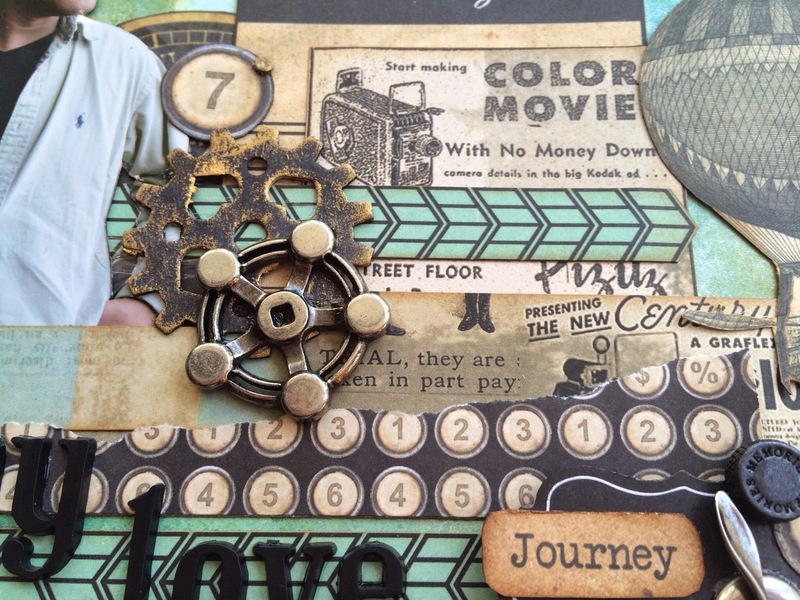 My last page is decidedly masculine in tone and makes use of the metal embellishments that come in the kit. I had planned to use the whole photo but decided to cut hubby out as I like the way he's looking away from the camera. 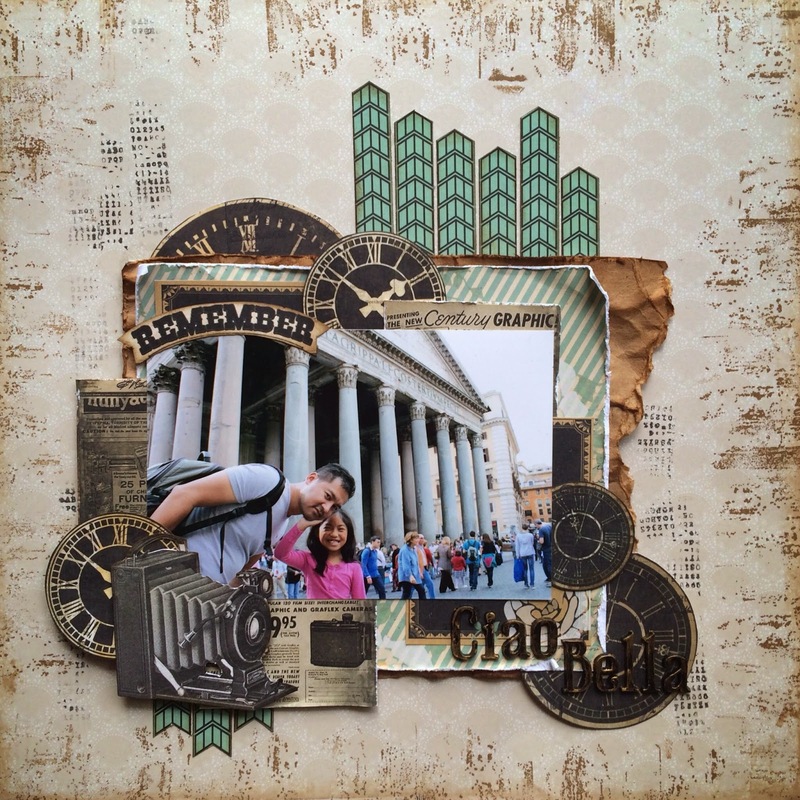 I layered strips of the patterned papers and did a bit of layering to bring out the varying textures and patterns. I also die cut out the heart gears, painted them black and added some bronze paint to make them look a bit rusty. I love the metal gears and wheels to match. 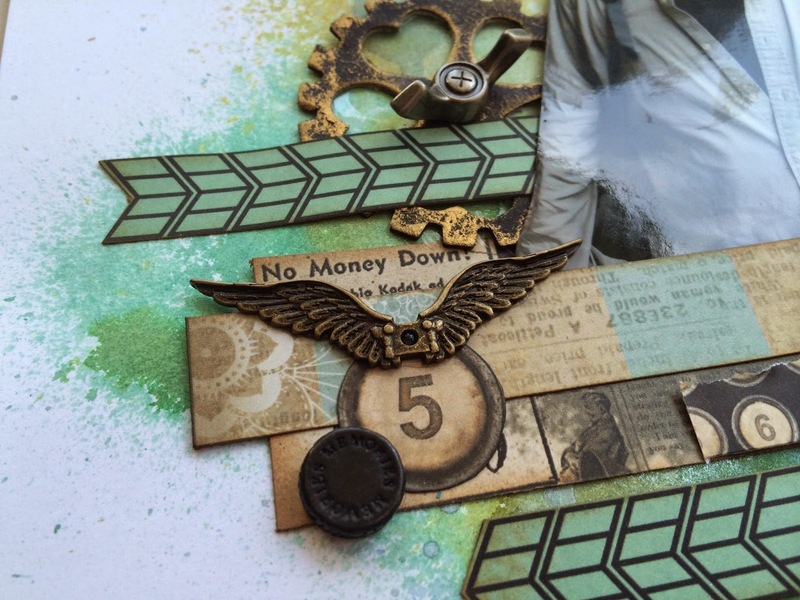 This time I left the Tim Holtz alphas plain as I wanted the stark black. The little propeller is the cutest little accent. 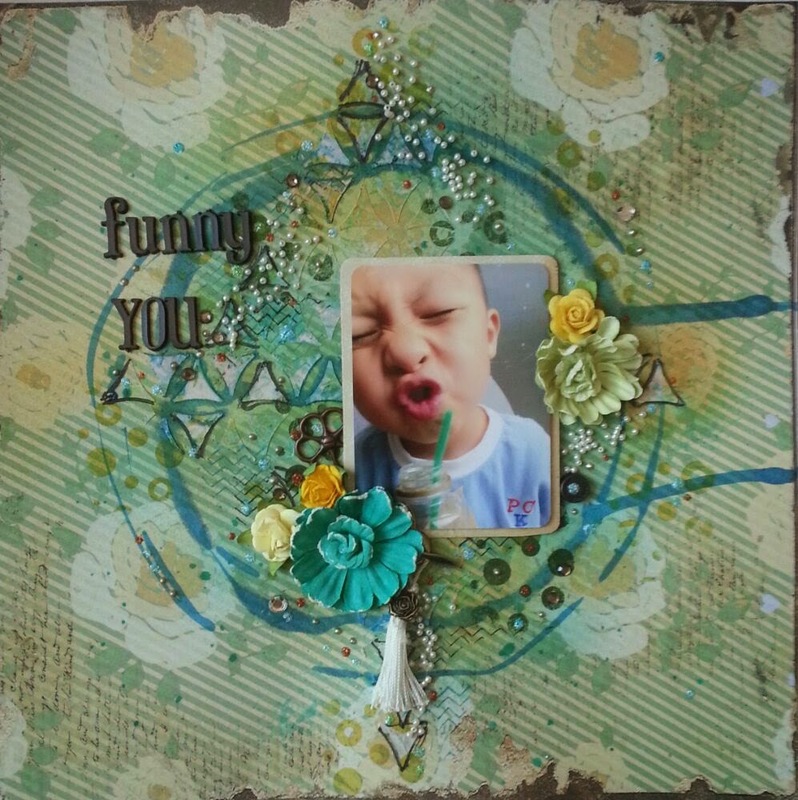 For the background paper, I used white cardstock and sprayed a trio of colours to match. 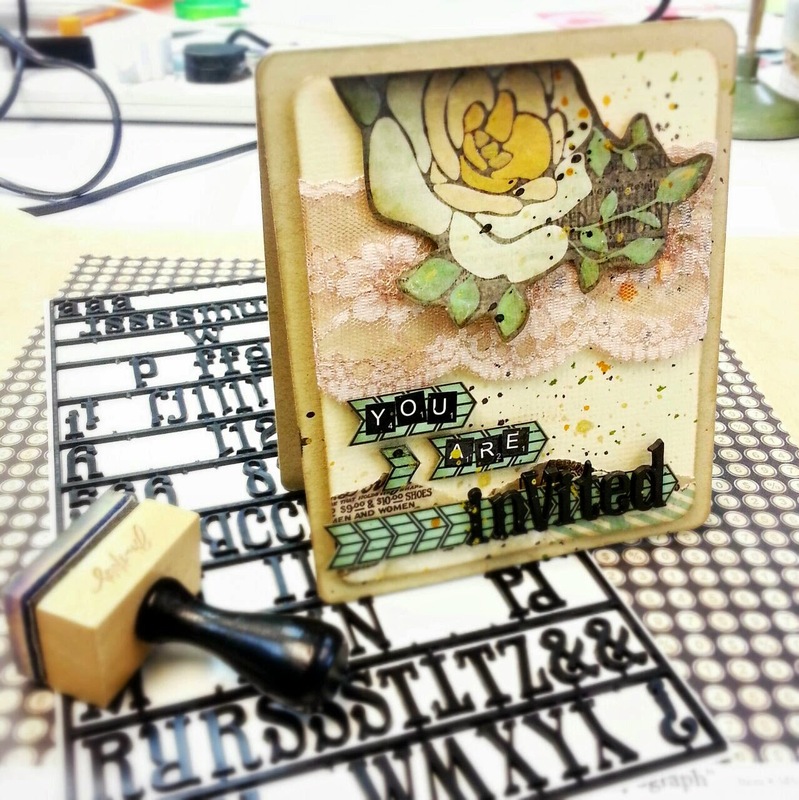 I use Lindy's Stamp Gang starburst sprays and I just love them. It may only have been three colours, but the sprays are so multidimensional that you will find even more colours in there. Again I added more metals to accent this masculine page. Aren't they amazing? 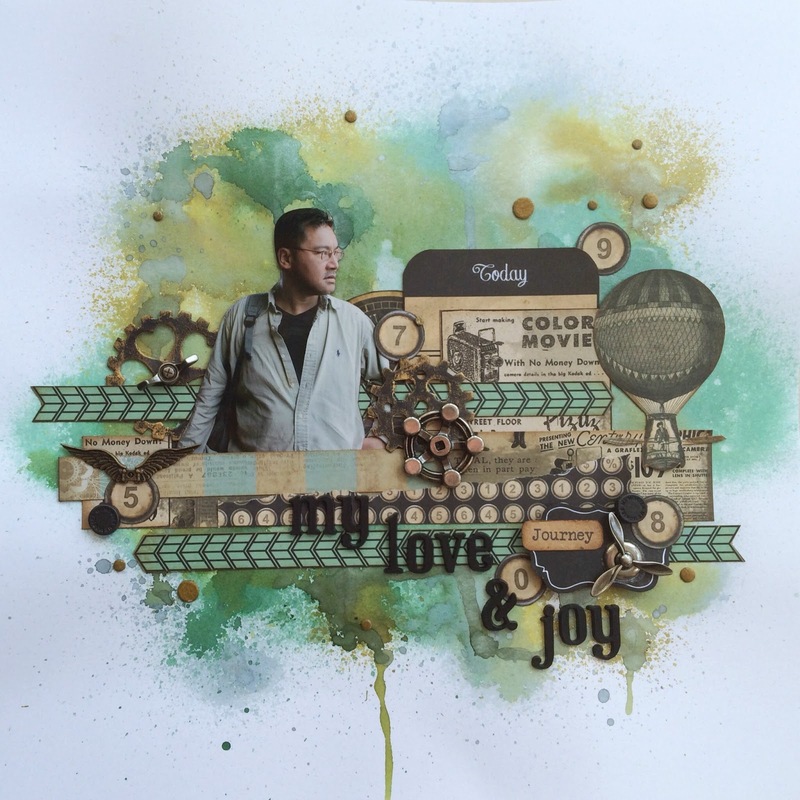 Such a versatile kit and you can see just how many projects you can make from one kit. Just look at Belly's projects! They kept coming and coming. Since I've posted this entry quite late, most of the free kit club crops have already taken place. 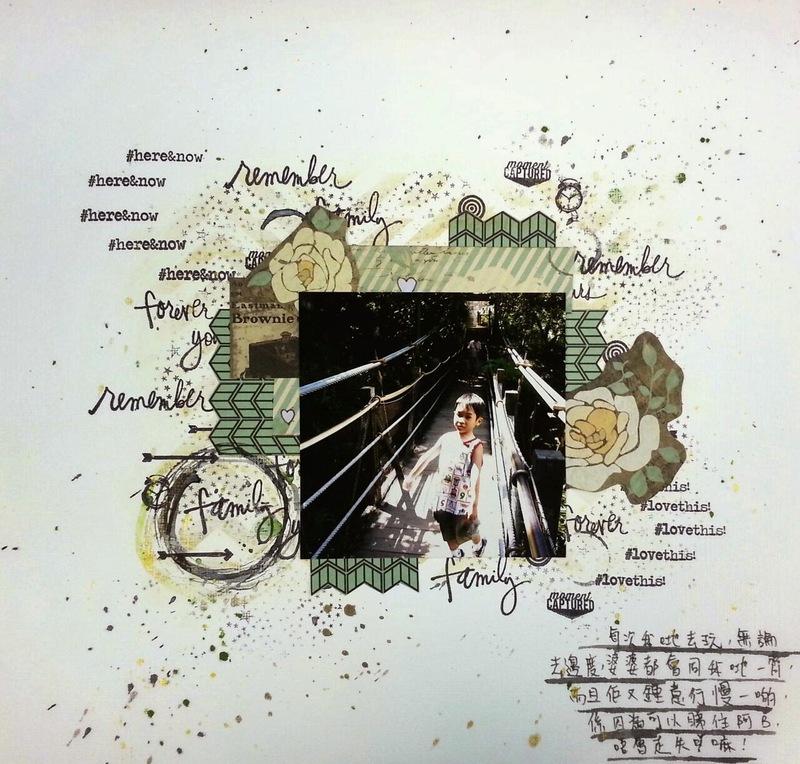 I was to do mine this Tuesday, but mother nature decided to come knocking in the form of a typhoon 8, so my session has been postponed to next Tuesday, 23rd September from 10:30am to 12:30pm at the HKMC shop in Sheung Wan. If you haven't started with your kit yet, come join me so we can catch up and get those pages done.